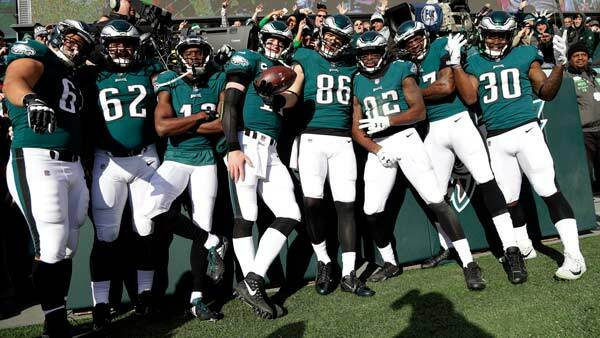 PHILADELPHIA -- Before they pack their bags for a two-week trip to the West Coast and three straight games on the road, the Philadelphia Eagles could already be NFC East champions. How they fare away from home will determine whether they stay here in January. Carson Wentz tossed three touchdown passes and the NFL-leading Eagles dominated the Chicago Bears 31-3 Sunday for their ninth straight win and fourth in a row by at least 23 points. The Eagles (10-1) reduced their magic number to clinch the NFC East to one and would secure their first division title since 2013 if the Cowboys (5-6) lose or tie Washington on Thursday night. That's the first step. Securing home-field advantage throughout the NFC playoffs is the bigger goal. "The next couple weeks, we have our work cut out," Wentz said. "Those are good football teams ahead of us. The next three on the road will be a good challenge. It was good to get this home win before we head into that." The Eagles play at Seattle next Sunday night and will stay out West to practice in California before facing the Los Angeles Rams on Dec. 10. They play at the New York Giants in Week 15 and return home against Oakland on Christmas night. "We have a unique set of challenges coming up," coach Doug Pederson said of the trip. "It's just one week at a time, one game at a time. That's what this team has embraced all season long. They are going to be prepared and ready to go up there." ZACH ATTACK: Zach Ertz caught 10 passes for 103 yards and one TD to become the first player to surpass 100 yards receiving for the Eagles this season. Ertz leads the team with 55 receptions for 639 yards and his seven TD catches are tied with Alshon Jeffery. "It just shows you how unselfish this team is," Pederson said. "The fact that it's not all about one guy. It's everybody. Everybody's making plays on offense. The fact that we're spreading the ball around and everybody's involved and we're still being efficient on offense is a tribute to the way these guys work and practice each week." Ertz was on the sideline with most of the regulars before going in the game on third down to make his final catch on a pass from Nick Foles. "It shows how close these guys are, how much we truly care about one another," Ertz said. "Everyone is happy for the other man's success. I think that's a testament to this team." GROUND AND POUND: LeGarrette Blount ran for 97 yards, Jay Ajayi had a 30-yard run that ended with Nelson Agholor recovering his fumble in the end zone for a TD, and the Eagles racked up 176 yards rushing. Meanwhile, Philly's defense held the Bears to just 6 yards rushing. Jordan Howard, who entered leading the NFC with 841 yards rushing, had 6 on seven carries. ROOKIE MISTAKES: Rookie quarterback Mitchell Trubisky, making his seventh start, was overwhelmed by Philadelphia's ferocious defense. He was 17 of 33 for 147 yards, threw two interceptions and was sacked twice. "I don't like losing, and that's a big motivator for me," Trubisky said. "You just get that sick feeling from it. Hopefully a lot of those guys in the locker room feel the same way. It motivates us to go back to work and get better for this week. You go out there and get embarrassed, and you know you're capable of better. So hopefully we look within ourselves and get better for next week because I know we're capable of playing better." FLIPPING AWESOME: Wentz had a 15-yard TD pass to Agholor, who flipped over defenders into the end zone to make it 14-0 in the second quarter. Before that play, Wentz had a spectacular run when he spun away from a blitzer and scrambled 16 yards on third-and-9 to extend the drive. SUPPORTING COACH: Bears coach John Fox is 12-31 in three seasons and faces questions about his future on a weekly basis. But players have his back. "I would love to have Foxy back for many years," defensive lineman Akiem Hicks said. "He's one of my favorite head coaches I have ever had."